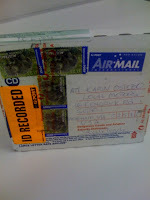 This package is, of course, the design file pacakge containing Filski's PanTerra fresh from "down under". Note the Koala's on the stamps.....awesome. Well, the promise was that we would create a forum for competition and that designers would join the site and community, interact with each other, and vote up its favorites. 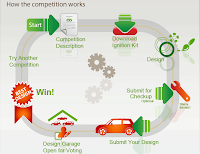 At that time, Local Motors would award a prize to a winner in exchange for the right to use his design. Simple enough. Over the last several weeks it has not been an infrequent occurrence for disbelievers to post on comments in various places in the blogosphere and web that we might somehow be engaging in stealing designs by creating a community like LM. It is our hope that the orderly and respectful interplay within the first competition banishes this skepticism and locks it away safely. Welcome to the Web 2.0 revolution where true "community" ought to be reminiscent of what the word meant before the web even existed: trust, collegiality, respect, assistance, etc. We are so proud of the community at LM. We would simply not be here without you. Great cars would not make it on the road without your contribution and vision. You deserve the respect, attribution, and payment for the use of your hard-earned design. Filski has earned it and we cannot wait to see who is next. Last night was the mother of all awards shows, the 2017 Academy Awards, and cheap ralph lauren suffice it to say there were at least a couple interesting storylines that emerged from the evening. We're not here chanel replica to talk about accounting firms, though-our raison detre is handbags, and there were plenty on last night's red carpet. Because the Oscars are the most ray ban outlet rigidly formal of the big awards shows, a lot of stars appear in their gowns without bags in front of the cameras, but replica watches uk we still spotted nearly 20 great ones. Check out our favorites below, and if you know the origin of one we weren't able to identify, let us know in the comments.